U.S. Patio Systems and Home Remodeling is an authorized dealer of TEMO pergolas serving St. Paul, Minnesota. What is a pergola? A pergola is a type of outdoor shade structure featuring a raised horizontal lattice that is supported by a series of vertical posts or pillars. Pergolas, which are also sometimes referred to as arbors, have been used for centuries to provide both shade from the sun and visual interest to an outdoor area. Though originally made out of wood and seen almost exclusively in garden settings, today, the pergola is available in a variety of both man-made and synthetic materials and has an ever-growing number of practical applications. 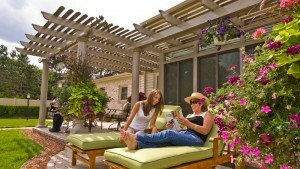 Pergolas are popular as backyard deck additions, breezeway coverings, and landscape design elements. Whichever style of TEMO pergola you ultimately end up choosing, you will be able to enjoy the perfect balance of sun and shade wherever you decide to put it. TEMO manufactures both free-standing pergolas and pergolas structures that are designed to attach to your house. There are many possibilities to consider when you decide to invest in a beautifully crafted TEMO pergola. Contact U.S. Patio Systems and Home Remodeling for more information. We are a TEMO pergola dealer serving St. Paul, MN.